Making the Grade: A+ Lunches & Apples! The fall season brings the start of a new school year, and welcomes in “new” produce, notably apples! For an A+ grade this season in healthy eating, make gradual changes with your dietary choices. Lunch is a great meal to start with and by packing your lunch, it can help you plan for better options towards ensuring a healthy eating plan. Whole-Grains: Choose whole grain breads, bagels, or tortillas for your next sandwich or wrap. Look for “whole” indication to precede the type of grain listed in the ingredients. It should be one of the top ingredients. Dairy: Pack or select low-fat milk from the cafeteria. You could also pack a yogurt or cheese stick and keep them at their best with an ice pack, or top your salad or sandwich with a small amount of cheese. Lean Protein: Think about packing any leftover meat, poultry, or fish you had for dinner last night. Single-serve cans or pouches of fish are simple ways to include more fish in your diet as well. Try to branch out with plant proteins such as beans, lentils, or tofu, which you can add on top of a salad or in a soup. Vegetables and Fruits: Fresh, canned, frozen or dried veggies and fruits are all options. What’s your preference? What is easiest for you to prep and pack? As mentioned earlier, it is apple season! 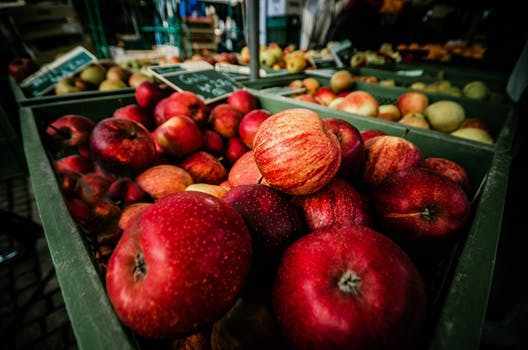 Apples get an A+ grade when it comes to easy of packing (and eating), provide key nutrients for a healthy body (e.g., fiber and antioxidants) and are a quick low calorie snack option! There are many varieties to choose from to satisfy various flavor preferences. Pick a Fuji or Honeycrisp for sweet options; Granny Smith or Braeburn apples for those that prefer tartness (among others). Check out the DAHLC September culinary offerings featuring apple recipes including apple crumble, and apple pancakes here! Go ahead and pack an apple in your lunch… it may indeed keep the doctor away!